Remember Mars's gravity is about 1/3 that of Earth. However far something might get flung on Earth, it'll travel further on Mars. Having said that I await with...er...curiosity what theories are presented. I'm happy to admit I haven't a clue. 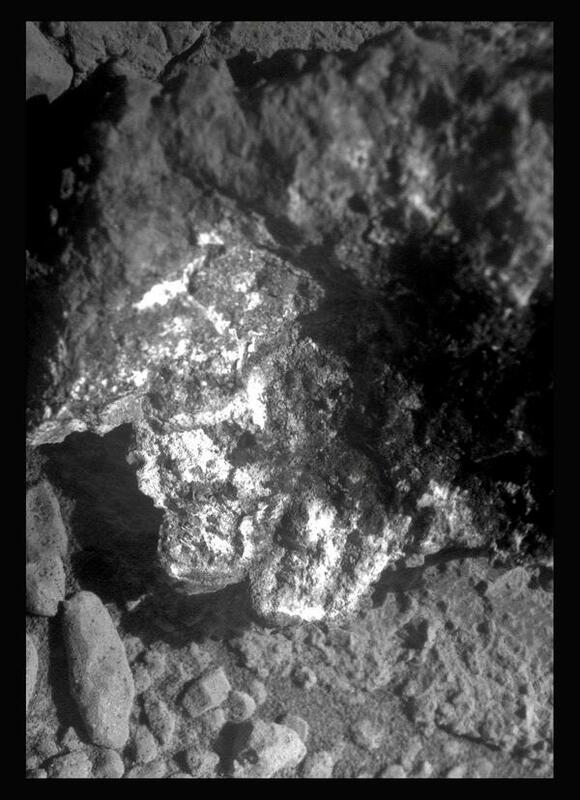 Could it be a bit of scrunched up insulation from the rover that worked its way loose? "It obligingly turned upside down, so we're seeing a side that hasn't seen the Martian atmosphere in billions of years and there it is for us to investigate,"
the article says the rover hasn't moved in a month..therefore how could one of its wheels have moved the rock into shot? Also DM is taking mission SOL3536 into discussion but this mission is not related to the initial mission pics of SOL3540+3528. I by myself do not think that the object was moved into focus by the wheels of O. Opportunity made a turn to face in a new direction on sol 3540. 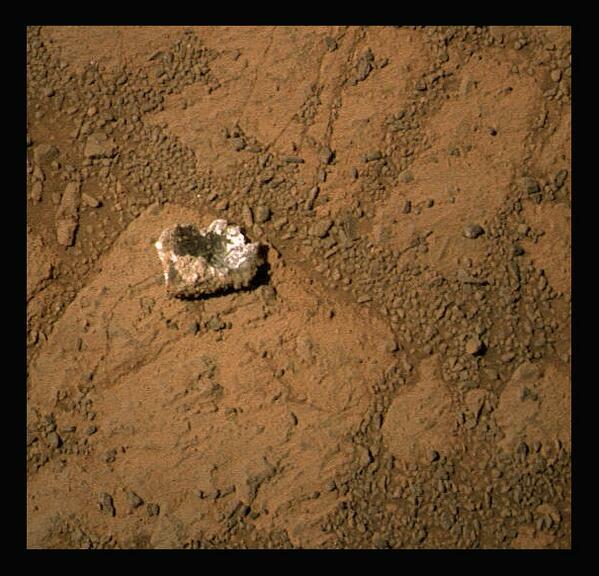 The rock wasn't there on sol 3536, but was there on sol 3540 after the turn. The best guess right now is that one of the wheels snagged the rock during the turn and knocked it loose. Don't think of this as hitting a loose rock with a fast-moving vehicle. Think of pulling on a stuck rock until it suddenly pops loose. You're not looking closely enough. There are several disturbed pebbles and areas of soil that appear to trace a path back toward the rover. Here's a very rough before/after comparison. I've tried to eliminate most of the perspective shifts between the two images, but there are still quite a few distortions. Still, it's good enough to get a general feel for how things changed. It looks to me like the Pinnacle Island rock entered from the lower left corner of this image. There's a pretty large divot in the soil right at the bottom of the image and sand has been scattered up onto that flat piece of bedrock. The rock then skidded/bounced across that bedrock, leaving another smaller disturbed area in the soil between the two flat areas of bedrock and knocking a couples pebbles out of the way. If you look carefully at the flat bit of bedrock on which Pinnacle Island is resting, you'll see that several small pebbles have been scattered. Opportunity made a turn to face in a new direction on sol 3540. Is that an assumption of you that O did a turn or do you have a source for that maneuver? We can all speculate, but the only way we will get any answers is with further NASA releases. It'd be a real surprise if in a few days it vanished again wouldn't it? Don´t laught but I decoded the pics references of SOL3528+3540 this morning with the target to find out if the object disappeared or appeared. But I had no luck. The sol 3540 sundial images were taken about 40 minutes before the first images of the Pinnacle Island rock, so I assume the rover turned some time after taking the sundial images. Oh, I wouldn't laugh. I did the same thing. That's really very good. It is easily possible to notice the differences and plot how the rock must have tumbled. Excellent work! I would love to see this entire area from behind the rovers point of view,Can you See the Kids tossin a little rock when the cam is pointed away from the Martians as they wal along with it and study it ? NASA will have a press conference on Thursday, the 23rd, to mark the date of the Opportunity rover's 10th anniversary on Mars. The mysteriously appearing rock, and whatever has been learned about it by that time will doubtless be a prominent topic of that conference. It will be held at 2 p.m. Eastern Standard Time, (11 a.m. Pacific, 1900 GMT). It can be viewed live, and archived, at NASA TV. Good to See Peri back too ! It doesn't look like a rock. It seems to be metallic and it might be a piece of a machine.